Source: Charlotte Firefighters, Charlotte. Courtesy of Waymarking.com. 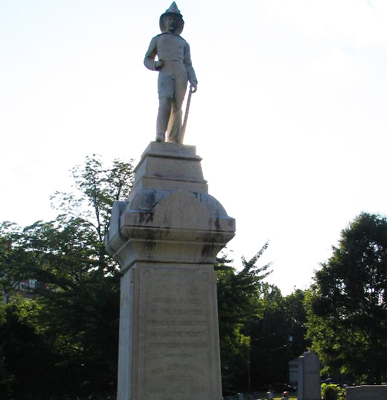 This memorial, dedicated to Charlotte's fallen volunteer firefighters, depicts a late 19th century fireman standing poised and calm but ready as he steps forward with his right leg. He wears a large brimmed fire helmet and the traditional dress of fireman of the period, and in his left hand he holds what appears to be the nozzle of a fire hose. A fire extinguisher sits behind him. The statue rests atop a tall plinth with a tiered and embellished cap. The plinth sits on a three tier base. Side: INDEPENDENT / HOOK AND LADDER CO. / ORGANIZED / AUGUST 4, 1868. The plinth and statue appear to made of granite. The plinth rests on what appears to be two tiers of marble and this rests on a square granite foundation. The monument sits near the entrance to the Elmwood Cemetery off West 6th Street. The monument is located in a grassy lawn with grave markers on the perimeter and mature shade trees in the background. Portions of the Charlotte city skyline are visible to the south.